In a new shocking undercover video by the Center for Medical Progress, a former Planned Parenthood abortionist explains how the abortion provider would dodge state law and employees would forcibly rip apart aborted babies. 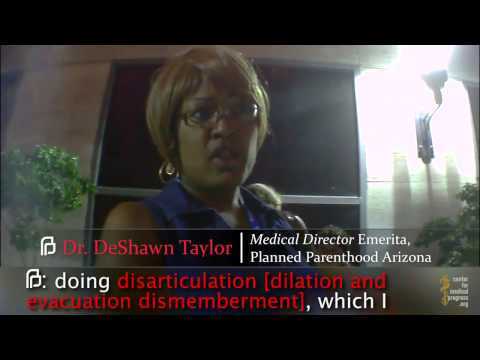 At a Planned Parenthood conference, Dr. DeShawn Taylor, an abortionist from a Los Angeles facility and former medical director of Planned Parenthood of Arizona, described to CMP journalists how she would dismember a baby in order to harvest as many organs as possible. Tiny human organs could then be sold to researchers for profit. “It’s not a matter of how I feel about it coming out intact, but I gotta worry about my staff and people’s feelings about it coming out looking like a baby,” she said. Taylor also describes how much easier it is to dismember a baby by delivering it illegally in the breach (feet first) position. A procedure which is known as “partial-birth abortion,” which is illegal in all states. “Breach makes it a lot easier, because you can, you know, but the thing is, there’s still going to have to be some decompression of the calvarium for it to come out,” she said. When Taylor was questioned by the investigator how the abortionist would tell if the baby was alive, she admitted that she would only obey Arizona state law based off who was in the room when the baby was ripped out of its mother’s womb if it was still alive. Arizona state law passed in 2015 requires abortionists to take the baby to the hospital in an effort to save the child’s life if it survives the procedure. “In Arizona, if the fetus comes out with any signs of life, we’re supposed to transport it to the hospital,” Taylor said. You can watch the new Center for Medical Progress video below but a fair warning its very disturbing.